The 103rd release on Majestic Family Records finds Gvozdini making his debut appearance on the label. The Ukrainian producer is fresh off his ‘The Perfect Way For Us’ release on Balkan Connection and has also delivered great remixes for Stellar Fountain and PHW Elements. 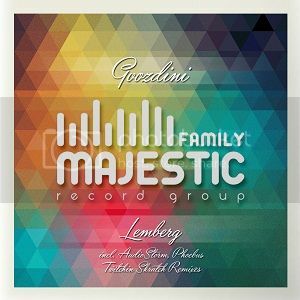 Gvozdini’s debut single for Majestic Family is entitled ‘Lemberg’ and it comes with remixes from Phoebus, AudioStorm and Twitchin Skratch. The original mix leads the release off with a smooth hypnotic groove that’s well complemented with nice electronic accents and scattered claps. The driving percussion and soft rhythms give the piece great energy and as the lead stabs enter things are quite peak time. The main break furthers the melodic theme with a growing wave of mesmerizing synths. The climactic build is eventually met with a powerful re-entry and a huge second half finish which would have to be one of Gvozdini’s best works this year. The first remix is provided by Phoebus who is making his first appearance on Majestic Family. The Greek producer has been having a great year with releases on John OO Fleming’s JOOF label and Michael & Levan and Stiven Rivic’s Mistique Music. For his ‘Lemberg’ interpretation Phoebus has reworked the original elements into a gorgeous club construction. Rolling grooves, vibrant electronics and crisp drums all meld together for a pristinely produced dance floor gem. It’s a great complement to the original and the dreamy second half is full of great emotion. Awesome remix from Phoebus. The second interpretation is provided by AudioStorm who is also making his debut on Majestic Family. The Montenegrin producer has been one of 2014’s unsung heroes in the progressive house underground His releases on System Recordings, Sleepless Nights and Magic Room have all been awesome. For his ‘Lemberg’ remix AudioStorm has stripped things down just a touch and crafted a smooth, percussive interpretation that really hits the spot. Fueled by trippy lines, unique stabs and a mind bending breakdown AudioStorm’s remix offers something quite different than the previous versions. Well done. The third and final remix is provided Twitchin Skratch who is returning to Majestic Family for his second appearance. The Chicago based producer has performed with some of electronic music’s most well known artists including Mark Knight, ATB, Benny Benassi and Green Velvet. His first appearance on Majestic Family was a remix for Marc Pollen’s ‘Wrong’ which was released in July of this year. For his ‘Lemberg’ interpretation Twitchin Skratch has delivered a quirky tech house rework that makes great use of the bubbly electronics and smooth rhythmic components from the original. The bottom end has been radically revamped and presents a much funkier approach which not only adds nice variety to the release but should be perfect for a wide range of dance floors. Great stuff from Twitchin Skratch and a nice release from Majestic Family Records. Scott Williams, Shane Robinson, Maxi Iborquiza and etc.